The eight-engine Boeing B-52 Stratofortress jet was the USA’s first long-range, swept-wing heavy bomber. It began life as an intercontinental, high-altitude Cold War nuclear bomber. With each new variant the B-52 increased in range, power and capability, seeing active service in the Vietnam War, both Gulf Wars of 1991 and 2003, and over Afghanistan in 2001. 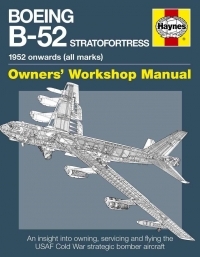 Author Steve Davies recalls its combat history, gets up close to look under the skin of the B-52, and talks to the flight crews and maintainers of this legendary aircraft.